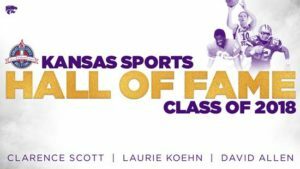 MANHATTAN, Kan. – Former Kansas State football greats David Allen and Clarence Scott along with women’s basketball star Laurie Koehn have been selected as members of the 57th Anniversary Class of 2018 to the Kansas Sports Hall of Fame, the organization announced on Wednesday. The Wildcat trio will be inducted in ceremonies on Sunday, October 7, at the Kansas Sports Hall of Fame in the Wichita Boathouse. With the three new members, the Kansas Sports Hall of Fame now includes 49 representatives with ties to K-State, while the 2018 induction class of 13 raises the total overall number of inductees into the hall of fame to 286. The sixth Consensus All-American in school history following the 1998 season, Allen’s Wildcat career coincided with some of the best years in K-State football history as the program put together four 11-win seasons during his playing days of 1997-2000. During that time, Allen set the school career punt-return records for yards (1,646), average (16.0), touchdowns (7) and attempts (103). During his All-American campaign of 1998, the Liberty, Missouri, product set school records for punt-return yards (730) and touchdowns (4), while he also had a 172-yard return game against Texas to set the school mark. His contest against the Longhorns featured a 93-yard touchdown, the last of a school-record three-straight game with a punt-return score. His three-straight games with a punt-return touchdown is an NCAA record and stood alone for 15 years until it was tied in 2013. Allen also picked up First Team All-America accolades in 1999 and 2000, and he earned four career Big 12 Special Teams Player of the Week honors. Following his K-State career, Allen played five seasons in the NFL with San Francisco, Minnesota, Jacksonville and St. Louis, and he finished his professional career with the CFL’s Calgary Stampeders in 2006. For his career efforts, Allen was enshrined in K-State football lore as he was inducted into the program’s Ring of Honor in 2008. He is one of only 14 players to hold the distinction and was only one of 10 at the time of his enshrinement. A defensive back from 1968-70, Scott played in the first game at now-Bill Snyder Family Stadium. As a senior in 1970, he earned First Team All-America honors from Sporting News and Look Magazine in addition to being named a First Team All-Big Eight performer. Drafted 14th overall in the 1971 NFL Draft by Cleveland, Scott played 13 seasons in the NFL and helped the Browns earn four playoff appearances, while he was a 1973 Pro Bowler. The Decatur, Georgia, native is a member of the K-State Athletics Hall of Fame, was inducted into K-State football’s Ring of Honor in 2015, and he was enshrined in the Atlanta Sports Hall of Fame in 2016. Koehn is the K-State and Big 12 all-time leader in career 3-point field goals made with 392 during her four-year career that spanned from 2001-05. Also the school and conference leader in 3-point attempts (942), Koehn was a two-time Second Team All-Big 12 selection (2004, 2005) and earned third-team honors as a freshman in 2002. She also picked up national Rookie of the Year honors from ESPN in 2001-02 and was a three-time Big 12 Freshman of the Week pick. A two-time Academic All-America honoree, who earned first-team accolades in 2005, the Hesston, Kansas, product went on to earn a gold medal with the 2002 USA Basketball World Championship for Young Women Team and a silver medal as a member of the 2003 USA Basketball Pan American Games Team. Koehn signed as a free agent with the WNBA’s Washington Mystics in 2005 and played four seasons with the organization, while she also played the 2012 season with the Atlanta Dream. She led the WNBA in 3-point field goal percentage in both 2005 (.467) and 2006 (.524). Tickets to the Kansas Sports Hall of Fame induction ceremony may be purchased online at www.kshof.org or by calling (316) 262-2038.